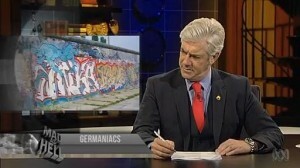 Recap: Mad As Hell, April 10th 2013 – Shaun Micallef Online! Winning numbers in Tatts’ Everybody Wins Lotto Draw No 001: 1, 2, 3, 4, 5, 6, 7, 8, 9, 10, 11, 12, 13, 14, 15 16, 17, 18, 19, 20, 21, 22, 23, 24, 25, 26, 27, 28, 29, 30, 31, 32, 33, 34, 35, 36, 37, 38, 39 and 40. This weeks episode was dedicated to the memory of Annette Funicello. 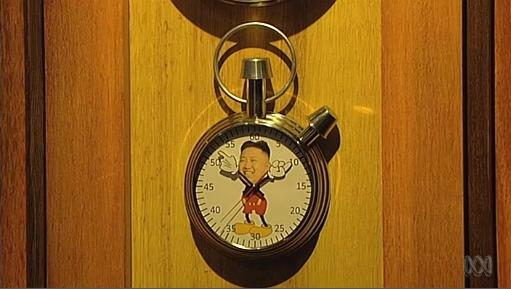 There was good and bad news from the yin and yang desk this week – joy over the closeness of the federal election, but sadness because the North Korea nuclear doomsday stopwatch says we’re going to be wiped out in the next week or so. Kim Jong Il was just a loveable nutcase, but his son is not quite as amusing – a bit like the Pink Panther and son of Pink Panther. His threats are even impossible: “throw all enemies in the cauldron [and] break their waists…” – how do you break a waist, not to mention where do you get a cauldron without the internet? In response, Beijing and Washington have been testing their defence hotline, which reporter John Garnaut described as “not quite… Dr Strangelove..”. 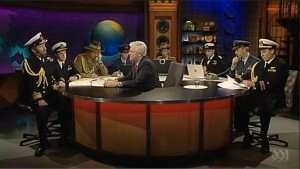 Shaun tested that theory with his own War Room round table, including Vice Rear Cabin Boy Bobo Gargle (Francis), who opined that North Korea couldn’t reach the US with its long range missiles. But when Shaun suggested they could hit Australia, and Gillard had indicated her support for the South, Gargle went to call Lucas Heights. 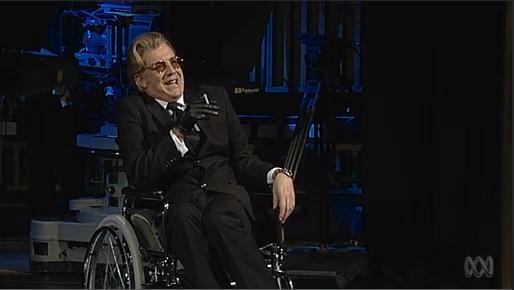 But Dr Strangelove himself (Shaun) had his own diabolical plan… involving poisoning meals and breeding Logie award winners down the bottom of mines. Gillards message to China during her visit was clear and strong; buy our minerals and protect us from North Korea. Why go to China? With a 30% popularity rating, that means 403 million people still like you, plus the traffic is better than western Sydney. Kevin Rudd was even further away, and described the situation with North Korea being like “a rerun of a bad 1930’s movie.” Shaun wasn’t sure what he was referring to (except maybe “She Done Him Wrong”), or how it related to his electorate, but if you do know, you can write in c/o the ABC – and possibly win some Annabelle Crabb sticks. was a ringworm (no graphic available). 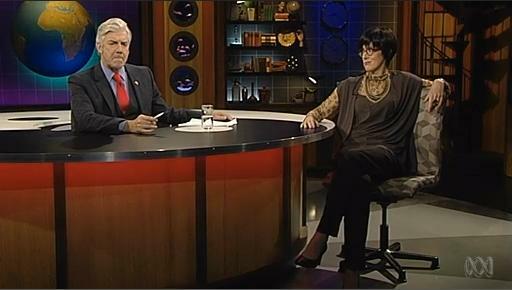 Vomitoria (Roz) says the Julie Bishop is extremely right by suggesting Labor is creating speculation on superannuation by not revealing information fast enough. Lily Dwarf-Planet (Emily) thinks the plan makes sense, ignoring the fact Labor leaked the plan it its usual cocked up manner, and that the speculation is caused by the media looking for any story. Lily asked Shaun to compare it to any of the oppositions policies, Vomitoria suggesting immigration when Shaun couldn’t think of one, and how they have little to no detail at all with no scrutiny or speculation. And Vomitoria can only speculate that the coalition will win the next election in a landslide. But the Coalition really do have a plan, and Tony Abbott has been clutching it in recent media events. Shaun thinks it’s more of a pamphlet than a plan, and Shaun re-dubbed recent footage to make it more accurate. Brochure would have been fine too. As part of a special HYPERthetical, Shaun raised the topic of Euthanasia. Abraham Plunkett believes in Euthanasia, and would hyperthetically have his mother, Chloris Webbler, euthanised if she was 93 and had in-curuable leprosy, and would take her to Belgium where it would be legal. Didi Dofnut, from Belgium’s tourism council, would welcome them with open arms, but if she was hypothetically the Prime Minister and hadn’t legalised euthanasia as promised, Abraham wouldn’t take her. Chloris thinks hiking through the Arden would be a nice alternative. 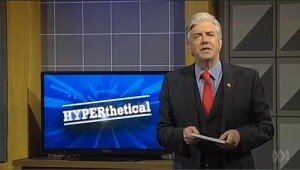 Barry Groans would hyperthetically resign her position if former Prime Minister Didi Dofnut, but former footballer Peter Astley wouldn’t know what to do if he was George Pell acting as Didi Dofnut – his opinion would be untenable. Chris Crocker lept to his defence. Chloris thinks that it wouldn’t be wise for her hypothetical self to be on a hiking holiday, even if she was to meet Peter as George as former PM Didi, and Waleed Aly thinks the trip might kill her. But as that’s death by mis-adventure, it’s legally OK. Solved. In news from countries other than Australia, Indonesia has been advised by Australia that it has 5 Hercules aircraft for sale – however they only have 6 hours before the sale on eBay ends. In Germany, a remaining piece of the Berlin Wall has been spared as a monument to it being torn down – ?! And to reduce tensions with North Korea, the US has suspended a missile test – sure to upset the NRA. Shaun then deferred to two ambassadors over the the recommendations for all embassy to leave Pyongyang – Christopher Hill, a former US ambassador, and Golden Slipper ambassador, Tammin Sursok. Maggie Bathysphere reported on the new FIFA goal line camera technology, which allows the precise position of the ball to be monitored between the umpire, the bookmakers, the moles and and insiders, who can then determine if it was a goal within 10 short minutes. Before Shaun’s Stemetil takes effect, he spoke to talkback listener Casper Jonquill about the plan to give kidney doners 6 weeks of paid leave, and he was outraged about the likelihood of exploitation by unwed mothers – he’s been waiting 8 years for an arthroscopy he doesn’t need, the CAA claim it’s not their responsibility to fix his dripping tap and if they want purer blood, they should stop inbreeding.